Would my immigrant grandparents (and yours) make it into the US today? Neil Swidey writes that those who signed up for DACA have the same grit, resilience, and affection for their country as his immigrant grandfathers. Refugee children from England arrive in New York during World War II. To critics of illegal immigration, let me say this: I get it. Your ancestors followed the law, waited their turn, and came to the United States through the front door, legally. So why should you be asked to support letting a whole bunch of immigrants who came here illegally be rewarded with a short path to US citizenship? As the grandson of immigrants on both sides of my family, I can relate. My grandfathers came to the United States in the early 1900s, one from a tiny, now-uninhabited island off the coast of County Galway, Ireland, the other from a remote village nestled in the mountains south of Beirut, Lebanon. As young men, Patrick Ridge and Saleem Swidey each left their parents and the hardship of their homelands to take their chances on a better life in Massachusetts. They worked hard, and in time they went from outsiders to upstanding Americans and community leaders. Shouldn’t we expect the same of today’s immigrants? 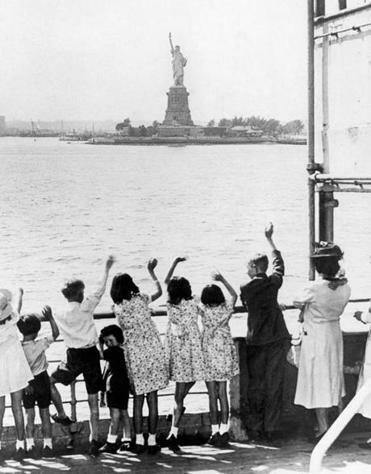 In a nation of immigrants like ours, almost everyone has an immigration story. It’s just a matter of how far back you look. That’s pretty wonderful. But the underappreciated downside of all those individual ancestor stories is they can cloud our perspective, making it hard to have an honest debate about immigration. Historians often talk about the perils of “presentism,” the distortion that arises from applying modern-day norms to people in the past. When it comes to our national shouting match over immigration, I believe there’s a sort of reverse presentism at work, which is making things worse. Many Americans are judging today’s immigrants based on the standards they think their ancestors faced when they arrived here. The trouble is, our understanding of our ancestors’ journeys — and the climate in which they made them — is almost certainly incomplete, if not incorrect. Yes, my grandparents came here legally, through the front door. But in the early 1900s, the front door was wide open. The federal government turned away only a tiny percentage of arriving immigrants. You didn’t need a passport or a visa to come here, because they weren’t required until World War I. American mills had a voracious appetite for cheap labor, and the big, profitable steamship companies supplied immigrants by the millions. 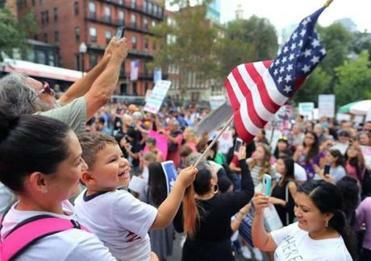 Activists turned out in Boston in support of undocumented immigrants who were brought to the United States as children. Consider this: In 2015, the US government awarded 1.05 million green cards, granting immigrants legal permission to come or stay here. That figure matches almost exactly the total number of immigrants who arrived in 1907 just at Ellis Island, when very few immigrants were being turned away and the US population was one-quarter of its current size. Today, most immigrants have little chance of getting in. Because most hopefuls don’t have an employer sponsor or close family member here to help them qualify for a green card, the government offers a “diversity lottery.” In 2015, the lottery awarded about 48,000 green cards, but attracted applications from an astounding 14.4 million immigrants. Instead of trying to hold today’s immigrants to the standards of a vastly different time, I try to look in the other direction. Would there be a pathway for my grandfathers to get into the United States today? When I do that, I can’t help but see them as Dreamers, the young people whose undocumented immigrant parents brought them here as youngsters. These Dreamers, of course, now face the prospect of deportation, thanks to President Trump’s decision to end the Deferred Action for Childhood Arrivals program, or DACA, unless Congress and Trump can deliver a deal to make the program permanent. Granted my grandparents weren’t brought here by their parents, but they did arrive with the help of older siblings. And in many other ways I see similarities between their paths and the ones taken by the Dreamers. 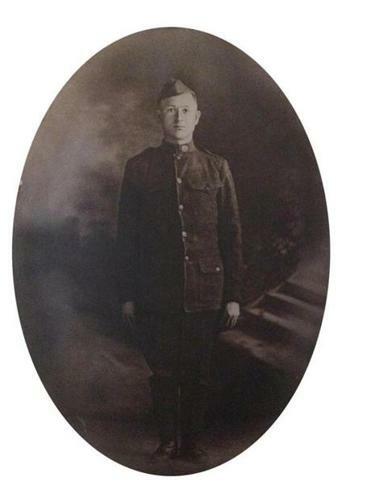 Patrick Ridge, the writer’s grandfather, in uniform. Because he served in World War I, the US expedited his naturalization process. When Patrick Ridge, my Irish grandfather, arrived in Boston, he initially stayed with his oldest sister in a working-class section of Newton. Her husband helped get him a job as a motorman with the Boston Elevated Railway Company, the precursor to today’s MBTA. When the United States entered World War I in 1917, Patrick, who was enormously grateful for the opportunity America had given him, immediately enlisted. Patrick served with distinction in the US Army’s Fifth Infantry Division, stationed in France, where his unit was gassed and he took shrapnel to his head, earning him a Purple Heart. After recuperating at a hospital in Luxembourg, he chose to head back out to the front. When finally the armistice was reached in November 1918, Patrick volunteered to remain in France for many months more as part of the contingent making sure the peace held. And not long after he returned to Boston, the US government rewarded Patrick with citizenship, expedited because of his service. That was his pathway, and it worked out well both for him and his adopted nation. He was entitled to disability payments from the Army, but eventually wrote the military asking it to give the money to someone who needed it more. The government continued sending the checks, but he held them and later returned them all, uncashed. While there’s a world of difference between the circumstances faced by Patrick and the DACA participants I’ve met, I see some of him in them. They share ambition, grit, gratefulness, resilience, and a tolerance for hard work. Not every Dreamer reaches that high bar, of course, and, yes, their parents did break the law by bringing them here. But remember what young people have to do to remain in the DACA program: graduate from high school (or earn their GED), have a job or be enrolled in college, pay taxes, and not be convicted of any felony or significant misdemeanor, or be affiliated with any extremist organizations. If they’re in college, they are not entitled to government grants or loans, meaning they’ve typically had to work their tails off to cover their tuition and fees. One thing Dreamers cannot do right now is enlist, since the US military does not allow undocumented immigrants in its ranks. But for a time, from 2014 to 2016, DACA participants — who by registering were considered “documented” — were allowed to enlist. Fewer than 900 Dreamers enlisted during that brief period, a statistic some DACA critics contend suggests a lack of patriotism. But that suggestion is flat-out wrong, says Margaret Stock, an immigration attorney and former lieutenant colonel in the Military Police of the US Army Reserve. Stock knows this terrain better than most. In 2008, she spearheaded the creation of a Pentagon program called Military Accessions Vital to National Interest, or MAVNI, to foster the recruitment of people with much-needed foreign language or medical skills. These military recruits had to be in this country legally through a valid visa. When the Obama administration decided to add Dreamers to the list of people eligible for the MAVNI program, Stock saw it as a mistake. She knew MAVNI’s narrow requirements would exclude way too many otherwise qualified DACA immigrants. To be eligible, they had to have a skill such as fluency in a second language, and many of the nearly 800,000 Dreamers speak only English. Those who are fluent in a language besides English typically speak Spanish. But because Spanish speakers are not in short supply in the military, fluency in that language didn’t make anyone eligible for the MAVNI program. “If they had set up a program specifically to enlist DACA students into the military — which would be a great idea — they would have probably gotten more than 30,000 to enlist over four years,” Stock says. Immigrants have a long history of military service. They made up about half of the Continental Army’s soldiers in the Revolutionary War, more than a quarter of Union troops during the Civil War, and close to 20 percent of those serving in World War I. For many immigrants, like my grandfather, military service expedited their naturalization. Stock points to Pentagon studies showing that, compared with native-born Americans, immigrants are more likely to show up for — and graduate from — basic training, more likely to serve out their term and then reenlist, and more likely to make the military a career. That’s why the military, particularly the Marines, places a major emphasis on recruiting green card holders. Yet there simply aren’t enough green card holders of military age interested in enlisting, in part because many have jobs with the employers that sponsored them. Instead of viewing Dreamers as a great resource and adding tens of thousands of them to strengthen our stretched-too-thin military, DACA is slated to end. If the emerging deal to save DACA fails, Stock says, it will result in the discharge of several hundred Dreamers who enlisted but were not yet naturalized. Stock knows all about the value of pathways that allow strivers to find a better life. She grew up in Wellesley in a family of nine kids. Money was extremely tight, especially after her father got sick. Although she was a bright student, her dad’s death when she was 15 sent her into a tailspin. She dropped out of Wellesley High School. For a while, she lived in a homeless shelter. Eventually, with the help of some caring adults, she managed to get admitted to Boston University despite having no high school diploma. She joined ROTC and transferred to Harvard, where she earned her bachelor’s degree. After serving in active duty in Alaska, she also earned her master’s and law degrees from Harvard. In 2013, largely in recognition of her work strengthening the military by attracting high-quality immigrants, Stock was awarded with a MacArthur “genius” grant. Not bad for a high school dropout. And, like the rest of us, she is the product of immigrants who found a second chance in America. Her paternal grandparents arrived from Eastern Europe as part of the same early 1900s wave that brought my grandparents here. Her mother’s family, who were French-speaking Acadians, came a bit earlier, from Canada. They landed in Boston in the 1700s, after the British deported them.